Discussion in 'Magazines' started by vogue28, Feb 6, 2019. Glenda Bailey taught you well Nina. She did. This is one of the most unrealistic covers I’ve seen in my entire life. Helicopter on a beach, and its that close? Plus the hair? tigerrouge, Valentine27, Bertrando3 and 1 other person like this. When a fashion magazine describes someone as 'on top of the world', that typically means, a few years later, we'll hear how they were in a pit of despair every day of their life, despite their apparent success. If I see one more bad Photoshop job of pasting someone's body and hair onto a fake background without even trying to make it look real, I will go insane. I can't believe someone gets paid for this. Such a disastrous execution. Valentine27 and Bertrando3 like this. Maybe they tried to pay tribute to that Lara Stone VP cover with the plane in the sky. Pity, because it failed terribly. Fun & quite refreshing. I am 100% ok with Elle going a little vulgar and out there. I was instantly reminded of the black and white shoot with Stephanie Seymour for British Vogue back in 1990 by Herb Ritts. Stephanie was photographed in very similar fashion posing before a helicopter! ivano and jeffandtheworld like this. guimon, CocoM and ivano like this. guimon, jorgepalomo and ivano like this. CocoM and sweetcaress like this. guimon, jeffandtheworld and crmsnsnwflks like this. WHAT A MESS ?!!!!!!!!!!! This is awful !!! From the cover to EVERY single picture in that editorial !!! Is it too hard for the hadids or jenners to learn how to pose or to AT THE VERY LEAST know or lean how to express emotions with their faces?????? GivenchyAddict and CocoM like this. The cover with the pink blazer is fantastic! 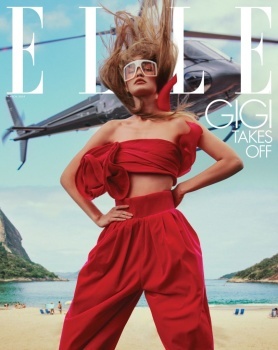 Gigi looks sensational here, and in the editorial. She's not avant garde, no, but she's a damn supermodel. And I'm here for it! TommysBaby, GivenchyAddict, ivano and 2 others like this. I like the second cover, I think it's quite good, it looks natural, however there's just too much retouching in various pics to make her cheekbones stick out or her face slimmer or other. The shoot doesn't look natural enough.